Fan Page Robot makes scheduling and posting to your social media pages incredibly simple. To help you get started, we're giving you a compilation of the existing research data about the best and the worst times to post content on various social networks. People tend to use Facebook during the middle of the day, as a sort of catching up with the day and for leisure. Facebook usage shoots up during the weekend and this is not particularly surprising, after all, most workplaces do look down on social media usage during the working hours. 11am to 4pm is the best time to post any major news concerning your brand. Post outside of business hours to gain more user engagement. Weekend posts get 32% more engagement. Weekends before 8am and after 8pm are the worst times to post. People use Twitter generally during commute and free time to catch up with the world. Every day after 8pm and on Fridays after 3pm are the worst possible times to post on Twitter. LinkedIn is a professional network, and hence higher engagement during the working days, after work isn’t that surprising. Tuesdays through Thursdays are the best time to share content. Noon and 5pm-6pm are times when user engagement peaks. Being a network for B2B audience, the weekdays and the working hours show a higher engagement but usually towards the end of the working hours. Mondays-Fridays 10pm-6am, are the worst times to post. The demography of Google+ is highly under-researched, but based on the history posting data on Fan Page Robot, morning before work is the best time to post. 9am-10am is the best time to post. Late mornings on weekdays is the best time to share posts. Early mornings and evenings are the worst times to post. Pinterest activity peaks precisely during the hours when people indulge in leisure activity due to fatigue during the working hours or because of having a holiday or free time at hand. Saturday mornings are the best time to post content on Pinterest. Fridays 3pm is the peak time when fashion and retails content spike the most. Pinterest activity peaks at roughly 9pm. Sharing during normal working hours a serious no-no. All research suggests that Tumblr is frequented by a certain audience which surfs the internet after work and at late night. Low engagement during work-hours and days is hence not surprising. Posts shared on Friday evenings at around 7pm receive the most clicks in 24 hours. Sundays through Tuesdays 7pm-10pm are the peak hours. Tumblr primarily sees night-time activity, because of this posts in the daytime practically disappear. The worst time is to post before 4pm. The working hours are the worst time to post on Tumblr, as mentioned before, the audience peaks as night-time approaches. Instagram activity largely shows no ups and downs except minor changes on Sundays and Mondays. People tend not to interact with Instagram videos during working hours but do with the pictures, which isn’t very surprising if you think about it. 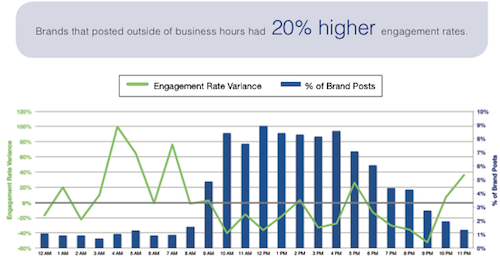 Instagram witnesses a consistent engagement throughout most of the hours and the days. Mondays are the days when user engagement sees a slight spike. Off-work hours are the times when user engagement with Fortune 500 companies spikes, as per study. Video engagement sees a spike through 9pm-8am, suggesting that people engage with videos only when not working. Posting during the working hours showed considerable negative impact on user engagement with the content shared for Fortune 500 companies. User engagement witnesses a slight dip on Sundays.